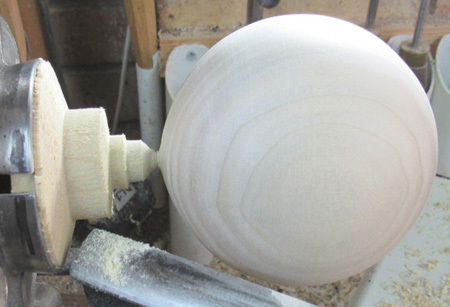 For many years now I have gained great pleasure from writing about woodturning in addition to actually taking part in the activity. Quite often, and especially when there is a possibility of needing to repeat a piece at a later date, I write a project report, and I have always said, if you want a copy, you only have to ask. Now, I have decided to take the initiative a step further, and make all my project reports available as .pdf downloads from this page. The only thing I ask is that if you make something as a direct result, please let me have a picture with some simple details, and I will try to display your work here also. I hope you enjoy what you find here, and if you have anything to say, please do not hesitate to get in touch. Please bear in mind the fact that the methods and procedures depicted in these files are MY METHODS, and they work for me. They may not be the only methods available. A very simple design for a mustard pot with a lid and a spoon, and a glass liner which also has a screw-on lid. The wooden lid will happily fit over the inner screw-on lid. Download the project file for the mustard pot here. I have done a good deal of work to dispell the myth that segmentation work is difficult. This project will carry you through all the basics, allowing you to make a stunning piece, to either sell or put on show. Download the segmentation basics project file here. This link gives you access to the segmentation tool referred to in the segmentation basics project above. 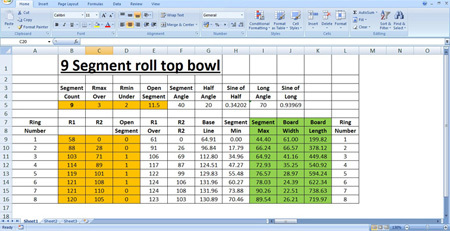 The tool is an Excel spreadsheet which has been set up to calculate all the timmber requisites for a segmented bowl, with no limit on the layer or segment count. Download the segmentation tool here. This apple is well within the capabilities of all turners, and takes less than a couple of hours to make. I regularly make them as a demonstration piece in about 90 minutes. Download the open segment apple project here. 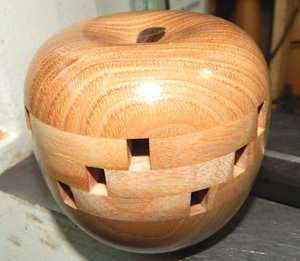 Here is a simple guide on how to make a segmented lidded box. 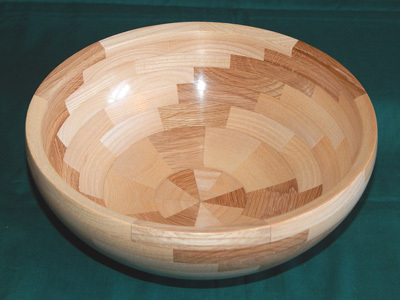 Too many people think that segmented work is difficult, IT IS NOT, why not have a go and see for yourself. The methods I use and the results I achieve can be duplicated by you with ease. Download the project file here. Singapore balls are a bit of a mystery. It takes a good while to make one, but it really is well worth it in the end. rather the instructions presented here to make the basic ball. Download the singapore ball project here. Making a wooden ball is a bit of an art, I know, because I have been trying to do it now since 2008 with varying rates of success. The basic ball used in the Singapore Ball project needs to be very accurate (round to within half a millemetre). 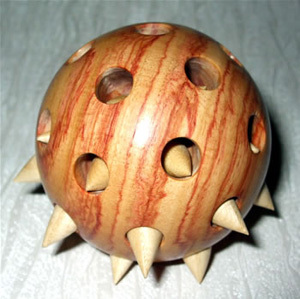 This project will let you make balls which are accurate to within a fifth of a millemetre. This method is easy, and should be used instead of the method used in the Singapore Ball project. Download the ball cutting project notes here. Here is a simple guide on how to make both wodden and acryllic pens. They are quick to make, and sell easy once you have mastered the skill set. This guide will also steer you around the need to buy too many specialist tools. Yet again, these results can be duplicated by you with ease. Download the project file here.